Discussion in 'UFC Discussion' started by Captain_Dammitt, Aug 20, 2015. Bendo should take it. Is Benson staying at WW or is Alves dropping down??? At 170 I do believe. Cool, I know Alves was talking about dropping so I wasn't sure. Yah wtf, I was thinking the same thing man. 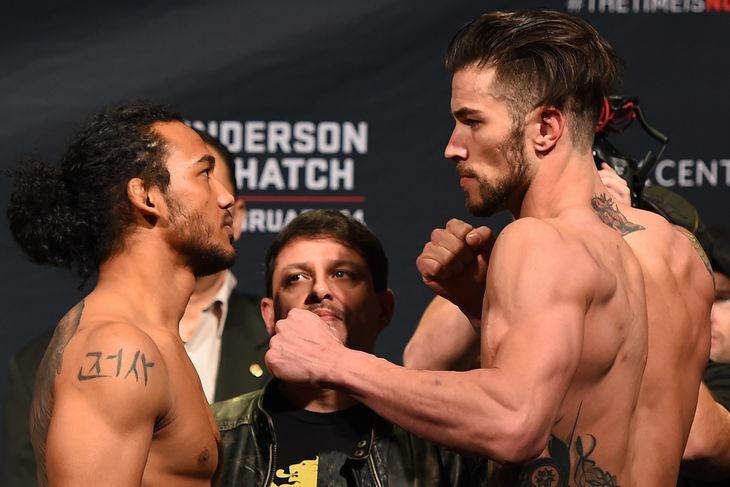 Does Ben Henderson even speak Korean? He's lived his entire life in the states, how much ties does he have with Korea, really. There're American international students in Korea who probablyknow 10x more about Korean and Korean culture than he does. I feel like there has to be a major size difference. Too long since Bendo's fought. He's almost as Korean as Cain is Mexican. Cain at least has conversational Spanish, how much Korean does Henderson speak? Also, US has much closer ties to Mexico than Korea. Yeah.... Alves hits a lot harder tho. A lot harder. He has been wrestle fucked a couple times though and Bendo is really good at surviving trouble on the feet while working to get the fight to the ground. Really really tough fight for Alves. Lol, there's a good laugh!! And right when I needed it too. Tough comeback fight after eye surgery for Bendo. Bendo usually doesnt force the takedowns. He rather tries a few with good timing which only GSP has done against Alves. Story recklessly went for the takedowns and ended up wall and stalling Alves, even arguably losing the fight. Last Fitch fight Alves looked pretty bad, but you have to keep in mind he apparently had his worst weight cut ever for that fight. In general IMO you can say Alves has some of the very best takedown defense at 170. And in contrast to Thatch he can both survive on his back and get back to his feet.